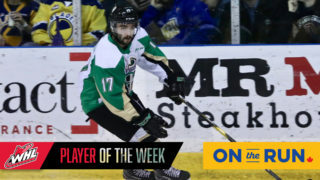 Prince Albert, SK – Sean Montgomery tallied his first career WHL hat trick in a 6-1 win for the Prince Albert Raiders over the Saskatoon Blades in Game 1 of their best-of-seven series on Friday night at the Art Hauser Centre. 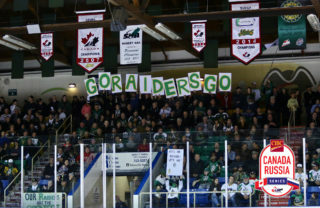 Montgomery paced the Raiders’ offence with a goal in each period in Friday night’s win. 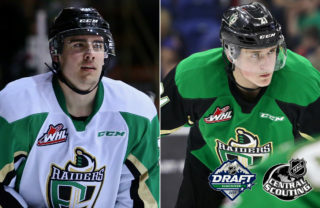 He’s the first Raider to have a hat trick in the WHL Playoffs since Milan Kraft on March 30, 2000. Brett Leason had a goal and three assists, while Parker Kelly also struck twice. Sergei Sapego chipped in with a pair of assists. The overager from Calgary got the scoring started 3:47 into the opening period. Brayden Pachal’s shot from the point went wide of the net and found Montgomery’s stick in the slot and the Calgarian one-timed home his first goal of the game. Less than two minutes later, the Blades evened the score. Chase Wouters picked up a deflected shot by Brandon Schuldhaus. The Blades captain spun, fired, and beat Ian Scott to make it a 1-1 game at the 5:24 mark. Before the end of the first, the Raiders restored their lead. 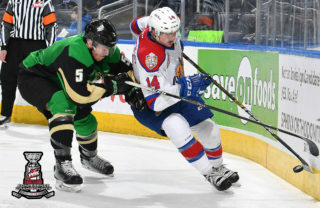 Nolan Maier stopped Jeremy Masella’s point shot, but Leason pounced on the rebound and buried a backhanded for his third of the WHL Playoffs with 7:53 to play in the period. In the second, Montgomery notched his second of the game that held up as the insurance marker. Leason fought through a check on the half wall and chipped a pass to the centre of the zone with one hand on his stick. Montgomery skated into the puck and went off the crossbar and in for his third of the post-season with 8:21 to play in the second. Late in the middle frame, Kelly tallied his first goal of the game. After Sapego’s original attempt was denied, the Belarusian blueliner circled the zone and found Kelly at the side of the goal with a backdoor pass. The Ottawa Senators prospect was able to get his stick on the puck and lift it over Maier for his second of the playoffs with 2:18 remaining. Montgomery completed his hat trick 5:51 into the third period on the power play. From the left faceoff circle, Ozzy Wiesblatt centred a pass in front for Montgomery. 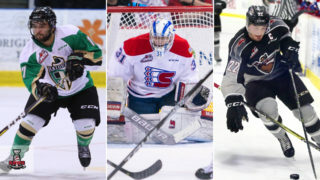 The overager redirected the puck past Maier for his fourth of the WHL Playoffs to cap off the hat trick. That goal meant the end of the night for Maier. The Blades netminder 31 saves in his time between the pipes. 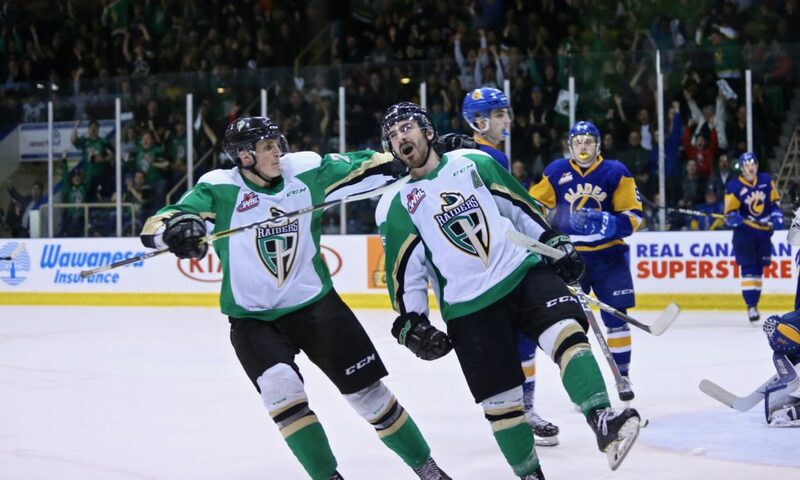 The Raiders welcomed backup Koen MacInnes with a goal in the affiliate player’s first WHL appearance. Kelly finished a backdoor pass from Leason for his second goal of the game with 6:20 to play. Scott closed out the win by finishing the game with 23 saves. MacInness stopped two shots in relief. Maier was saddled with the loss. The two teams meet again for Game 2 on Sunday evening at the Art Hauser Centre. Game time is 6 p.m. 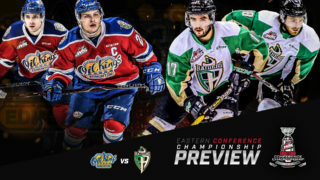 The game will be carried on Sportsnet and Sportsnet 360.